Sometimes I feel like the very concept behind third-party Transformers add-on kits is a personal attack on my own stupidity: "Sure, that $100 toy you bought is nice, but wouldn't it be marginally nicer if you spent another $115 on it?" In this case, the $100 toy is "Year of the Snake" Omega Supreme, and the add-on kit (which, full disclosure, I got from TF Source on a deep, deep, deep discount, because even my fiscal profligacy has its limits) is Maketoys' MCB-01 "Armageddon" set. The normal Omega Supreme was pretty good, thanks to having the proper paint, but the add-on kit strives to make him look even more like the G1 toy by adding big pale arches behind the shoulders, and turning the left hand into a proper gun, rather than some sort of pinchy claw. All good impulses! However, the execution is a little lacking. For one thing, you have to disassemble part of the figure in order to use this kit. 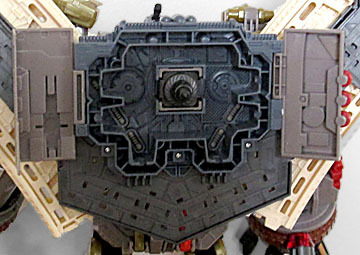 As you know, the best designs are ones that work seamlessly with the existing toy, rather than requiring modifications; to upgrade Omega Supreme, you have to remove the tip of his left hand, as well as the "doors" on his back in order to plug the backpack full of kibble in. 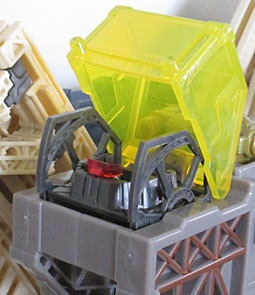 The doors plug into the backpack, and the set includes a piece that lets you turn the fingers into part of the foot, but wouldn't it have been better if they'd found a way to work with what was already there? Plus, putting all that stuff on the figure's back more than doubles the thickness of the toy, which makes it supremely top-heavy and unable to stand. Therefore, Maketoys also had to come up with some parts to plug onto the legs to add some stability. Thankfully, those just attach to existing plugs on the figure, but it still leaves him with pieces that don't blend into the overall design. But that's not to say everything is bad! The industrial design of the pieces on the backpack suggest the robot's scale, and the detailing on the new left hand matches the existing right hand perfectly. The finger-toes even make the foot look better! The coolest unnecessary feature, however, has to be the tiny little control center that gets installed in Omega's shoulder: if it hadn't been here, no one would ever have noticed its absence, but including it adds just a tiny extra touch of awesomeness to the overall product. An add-on kit that only worked in one mode would be stupid, so MCB-01 also has a City Mode. Much like the original G1 Omega Supreme, it invloves a lot of "partsforming": ie, taking everything apart and putting it back together in a different configuration. The instructions are invaluable, here. 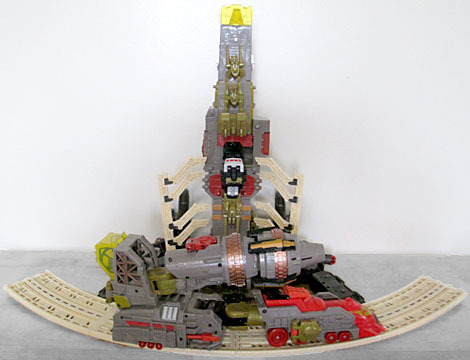 Rather than a complete loop of tracks, like the '80s gave us, this is just a segment of a larger track. Although most of the pieces clip together in one way or another, there's one big chunk that just sits next to the rest. Really? They couldn't come up with any way to make it connect? Did they run out of time? Are there hard deadlines for fan-produced projects? And while this is meant to be a launch pad for the "rocket" (aka, "the battleship stood on end"), that doesn't attach in any way, either, just resting in place. Not very secure! Plus, you have to reattach all the pieces you took off earlier, which surely won't wear down the plastic when you do it over and over, right? 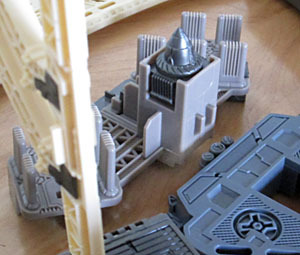 The eight articulated gantries that can swing over to (kayfabe) support the rocket are fun inclusions, but it'd be better if they actually lined up with anything specific. The little control center stays in its place in the robot's shoulder, but a clever joint in there means it can pivot so it's still level in train mode. And the big gun moves from the left hand into the right, with the claws clamping around it to give the train a better sort of weapon. The way the train's hinge joint is ratcheted means that it doesn't line up with the tracks very well, and the rear wheels are too wide for them anyway. Because of the way they attach to the rest of the base, they don't rest flat on the ground, instead "hovering" until a weight is put on them and they bend down, which isn't good: one of the "floor" pieces on mine is already showing a crack. The set features some electronics. 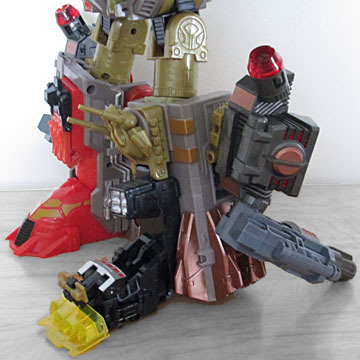 Needing an excuse for the the inclusion of the kickstands that go on his feet, Maketoys has turned them into... cannons? Cannon-shaped spotlights? Something. You can point them at the shuttle and light it up at night. 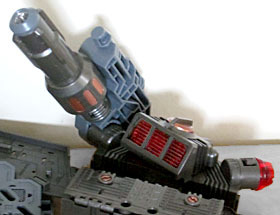 Additionally, the barrel of the gun lights up red. None of the electronic features are really "must-haves," and if keeping them out would have brought the price down, we'd have been all for it. Maketoys' MCB-01 Armageddon add-on kit is far from perfect. It unbalances the figure, it requires the temporary removal of parts that you're expected to put back in place later, not all the pieces hook together in the altmode, and there are superfluous electronic gimmicks. 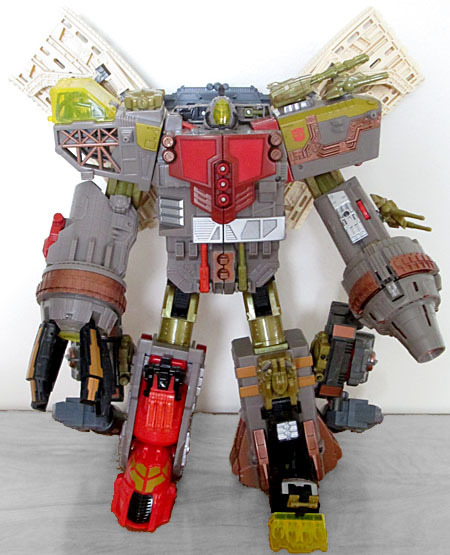 But it really does make the existing "Year of the Snake" Omega Supreme better - he just looks cooler with the added pieces, and being able to turn him into a city base is superior than whatever the hell it is he normally changes into. If I'd paid full price for the set, I might have to convince myself it was worth it; but for the sale price? Heck yeah it's a good bonus!